﻿ S17 @ Nimman Hotel, Chiang Mai | FROM $29 - SAVE ON AGODA! Have a question for S17 @ Nimman Hotel? "Hotel is located at a very good location." "Rooms were clean and staff were helpful." 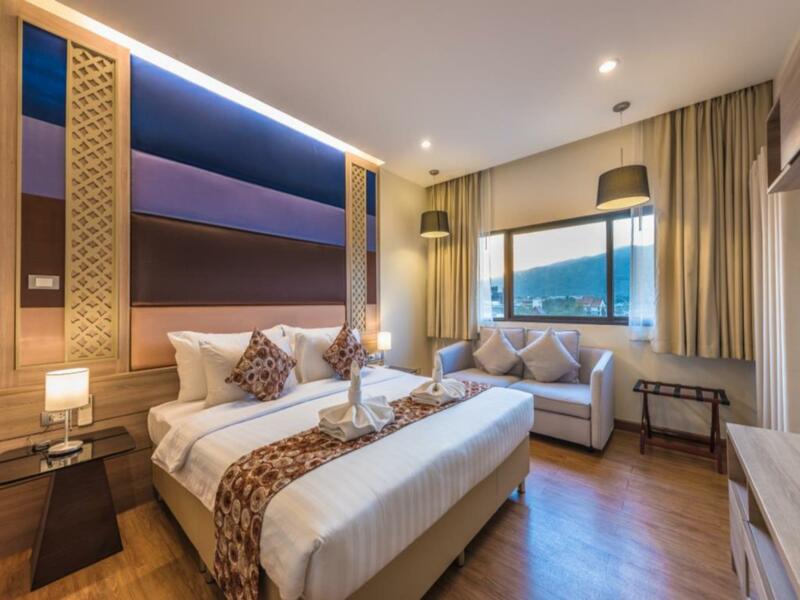 "The rooms were excellent size wise and had all the ammenitie..."
Well-placed in the nightlife, restaurants, shopping area of Chiang Mai city, S17 @ Nimman Hotel provides a most conducive spot for you to take a break from your busy days. Set 3 km from the excitement of the city, this 3.5-star hotel commands an excellent location and provides access to the city's biggest attractions. With its convenient location, the hotel offers easy access to the city's must-see destinations. S17 @ Nimman Hotel also offers many facilities to enrich your stay in Chiang Mai. To name a few of the hotel's facilities, there are free Wi-Fi in all rooms, 24-hour security, daily housekeeping, taxi service, 24-hour front desk. The ambiance of S17 @ Nimman Hotel is reflected in every guestroom. television LCD/plasma screen, additional toilet, complimentary instant coffee, complimentary tea, free welcome drink are just some of the facilities that can be found throughout the property. Besides, the hotel's host of recreational offerings ensures you have plenty to do during your stay. Whatever your reason for visiting Chiang Mai, the S17 @ Nimman Hotel is the perfect venue for an exhilarating and exciting break away. "Housekeeping team was generally nice and friendly." Hotel is very nearby shop, restaurant and convenient store. Also easy to get the public transportation for short traveling in the city. Room is clean and more space , feel very convenient. It would be a choice for next trip again. This hotel is a hidden gem in the Nimman area. It is clean and the staff are very friendly. I recently stayed here and arrived early around 11:30 am to drop off my bags. I knew the hotel check in is at 2pm which is standard but the ladies saw how tired I was coming from a long way. They were so nice enough to let me check-in at that time. Very appreciative of this kind service. Thank you ~ As I said when you pay for this hotel I truly believe you get the best deal in Chaingmai. Maybe in the future they can get a swimming pool and this hotel will be perfect . See you again S17 hotel! The rooms were excellent size wise and had all the ammenities i could ask for. The shower was very nice and always good to turn on the air conditioning. My only improvement would be to provide a chair to sit so I didnt have to sit on the bed all the time. I will come back to this hotel. Canadian couple late 20s working remotely in Chiang Mai. Grand Deluxe room was spacious and clean. Epic floor to ceiling windows which roll open completely. Fast internet. Very good location, close walk to all Nimman's trendy cafes, restaurants, and shopping. Easy taxi to Old Town. Hotel is located at a very good location. And they have bicycle to rental as well. Near to makro so if you want to buy anything, it is very convenient. In fact, getting around is very easy as you can walk to many attractions such as iBerry garden which is just 10 minutes of walking distance away. Room size is great too. Great value hotel. Modern stylish room. Not exactly on Niman but definitely walkable. You can hear some noise for airplanes from CNX but not a problem for sleeping. There is a tiny cafe called Flour down soi17 that make good latte. The staff was kind and helpful. The staff does not speak English and has zero sense of hospitality. Our bathroom had black mold on the tub, toilet hose and drain so profuse that it was shocking it had been “overlooked” —after drawing a picture to explain the problem, it was cleaned. The rooms are large but have zero warmth. The bed was the worst we’ve slept in in our 3 months in Thailand (like a wood board covered with a mattress pad). The breakfast was also the worst of the dozens of places we’ve stayed. We were charged 100 bhat for an extra blanket. They almost charged us for a towel used to clean up a spilled coffee—after making us feel 2 inches tall with a scolding and big to-do they let it pass. Considering this was the third most expensive place we’ve stayed (and we have stayed in some incredible places), this hotel is an absolute disappointment. Overall rooms are large and clean. Located within the Nimman area where nice cafes and restaurants are located. However for the price paid, it should be towards a 4 star hotel . This is probably more like a 3 star hotel. Breakfast spread is weak with minimal selection, could be better. The room was a decent size but a lot older than represented in photos. The bathroom was clean enough but most towels were grey and fraying; replacing them would make a world of difference. Housekeeping team was generally nice and friendly. Front desk is very efficient. I asked for a second key card to the room and was asked for a 300 baht deposit which seemed high but was returned in full upon check out. The 2 bedroom suite is spacious to fit all of us which is great and there is a washer in the space. It would be great if there was a dryer as well. The space looks clean but when you look closely it is not that tidy and a bit dusty. There are also ants in the bathrooms. Loved this hotel! Check in, was fast, staff was friendly and room was spacious, clean and comfy! Looks pretty new. Great location with access to many cool cafes and restaurants nearby. Would definitely stay here again. This hotel is right in the middle of the tourist district of Nimon Rd. With all the shopping, restaurants and things to see that this implies. Staff were friendly and the room was clean. The only problem that we had was that the shower drain was partly blocked so that if you tried to have a long shower the bathroom would have been flooded. The breakfast was basic but edible. Excellent new hotel in Nimman area close to lots of restaurants shops etc but not in a crowded location. Rooms are large many with kitchens. Free coffee etc all day in lobby, good free wifi. No pool or onsite restaurant but so many choices nearby. 10 minute walk to the huge Maya Mall with an excellent and cheap food court and western style supermarket. Will definitely stay again! Located in a nice area for explorations, there r nice food places & cafes just around the hotel within walking/Cycling distances. Do check out DeMuang - Northern Thai cuisine just 3-5mins walk down soi 17!! Big cozy two bedroom apartment. Impressed with the size of the rooms and with the living in between both rooms make the whole place bigger. Basic facilities such as iron & board, stove, utensils and microwave is available. Washing machine is also available and the three balconies are great area to dry your clothes. I went during songkran and my. Clothes are dried in less than an hour while placed there. Down part of it is I have to pay additional amount for early CHECK IN (charged PER HOUR), even though the room is available (which I guess the charges could have been waived off since the room is just sitting there waiting for me to check in at 2pm anyway).